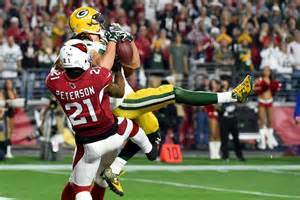 Here are several stats you may not know from the Packers 26-20 overtime loss to the Arizona Cardinals in their divisional playoff game on January 16, 2016 (the stats all reflect playoff games unless otherwise noted). Green Bay is now 16-9 in Saturday games (regular season and playoff) since 1966. They are now 9-3 in Saturday playoff games. Packers are now 2-3 in games that have ended with the score 26-20. Mason Crosby is one of the most accurate playoff kickers in post-season history. He is now 23-for-25 in playoff games in his career, a 92 percent accuracy rate. That ranks tied for third of all kickers in the post-season (minimum of 10 playoff game field goal attempts). He is one of only seven kickers with a field goal made percentage of 90 or better in playoffs. Seattle kicker Steven Hauschke tops the list at 93.8 percent (15-of-16). With their OT loss, Green Bay becomes the first team in NFL history to lose back-to-back OT playoff losses in consecutive years. The Pack’s five OT playoff losses since 1966 are the most all-time (second are the Colts with four). Green Bay did not score in the first quarter and are now 6-7 since 1966 in playoff games where they do not score in the first quarter. Julius Peppers had a sack in the game. He is one of 28 players age 35 or older to have a playoff sack. His 2.5 playoff sacks at age 35+ is tied for sixth all-time. Arizona had a 7-6 lead over the Packers at halftime. The Packers are now 3-14 when they are behind at halftime of a playoff game (since 1966). Green Bay had one turnover to two for the Cardinals. The Pack have now lost their last three playoff games when they have fewer turnovers than the opponents. The Packers are 17-7 in playoff games since 1966 when they have two or more takeaways. Aaron Rodgers was sacked only once in the game while the Pack defense sacked Carson Palmer three times. Green Bay is now 14-8 in playoff games when they allow one or no sacks in a game; they are 15-6 when the defense sacks the opposition QB three times or more in a playoff contest. Green Bay had a three-point lead going into the fourth quarter. The team is now 23-4 in playoff games since ’66 when they have a three-point lead or more going into the final period. The Pack defense had two interceptions and is now 11-4 in playoff games when they intercept the opponents two or more times. Rookie Demarious Randall had one of the two picks. The first-year player became the sixth Packers rookie to have an interception in a playoff game since 1966. The others: Ha-Ha Clinton-Dix, Sam Shields, Tyrone Williams, Craig Newsome and George Teague. Rodgers had a QB Rating of 77.9 for the game. In his 13 playoff starts, the Pack is 5-1 when Rodgers has a QBR of 100 or more, 1-2 if his QBR was between 80-99.9, and is 1-3 if Rodgers QBR was below 80. Green Bay is 1-5 in playoff games when Rodgers has an interception (he had one interception on Saturday). They are 6-1 in playoff games when he does not throw an interception. Jeff Janis became the ninth Green Bay Packers player to have two or more receiving TDs in a playoff game since 1966. The last was Greg Jennings in the 2011 Super Bowl. Janis had seven receptions for 145 yards. The 145 yards is the third highest for a Packers receiver in a playoff game. Jermichael Finley (159) and John Jefferson (148) are 1-2 on the list. Janis is one of five receivers for the Pack to have 140 or more receiving yards in a playoff contest. The Packers held the Cards to only 40 yards rushing in the game. It was the ninth time since 1966 that the Packers held their opponents under 50 yards rushing in a playoff game, but it was their first loss. Green Bay allowed 10 points in the fourth quarter. They are 2-9 in playoff games since ’66 when they allow 10 or more points in the fourth quarter. It is interesting to note that in the Packers last five playoff losses (this year and the previous four years of playoffs) the Pack allowed 10 or more points in each of those fourth quarters. Larry Fitzgerald had eight catches for 176 yards. That was the most receiving yards by an opposing player in a playoff game versus the Pack in the Super Bowl era. Eddie Lacy had 89 yards on 12 rushing attempts in the game. In the four playoff games that Lacy had 70 or more yards rushing, the Packers are 1-3. In their 18 playoff losses since 1966, the Packers have lost five of those games at home, one at a neutral site, and 12 on the road. The Cowboys have the most playoff wins over the Pack since 1966 with four. The 49ers are next with three. The Cardinals and Giants follow with two apiece.